Learn a three-dimensional forming technique. 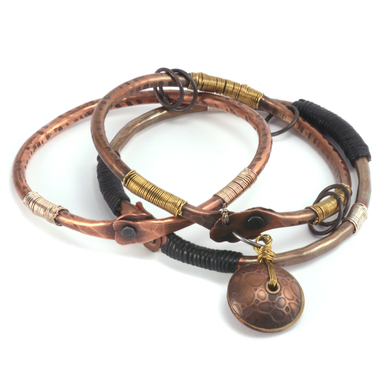 In this class, instructor Kim St. Jean, makes manipulating metal a breeze. 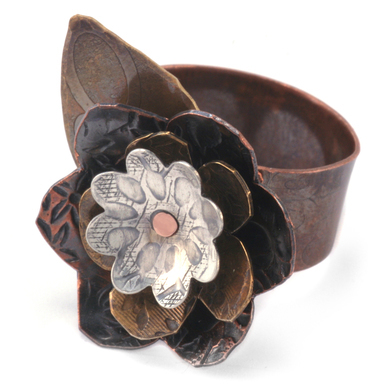 Learn to fold, shape and texture metal to create a unique cuff bracelet. This comprehensive class includes two bonus segments; fabricating a pod fold pendant and copper surface patina using the butane torch. Kim provides so much information that you won’t want to miss any of it. This class has a run time of 81 minutes and 24 seconds. A bead that measures 8mm to 10mm in size for the pod. I adore this video! I've taken the class (metal fold forming) from ksj and this video reinforces what I learned. For me, the repetition is great. This is a fabulous resource to help remember all the techniques for metal fold forming. Kim is a natural as a teacher, and what I like best is that she tells you the reasons behind what you are doing. Thank you Kim and Beaducation! I loved this video. I was a little hesitant to try this on a cuff. I've read about it and watched videos, but Kim makes the process easy to understand and now I can't wait to create a beautiful cuff bracelet too. Thanks also for all the tips and tricks you give us along the way. This was an excellent video. Easy to understand. It's hard to believe that this high quality instructional video is free. Thank you so much for this. Thank you so much for this - it was high quality, thoughtfully prepared and valuable. I'm grateful for it and look at the paid classes you offer. I love this class. It was easy to follow and my cuff turned out beautiful. Looks so impressive, almost like leather. Thank you so much for having free classes where we can learn these techniques. This class is perfect for the novice, very precise but understandable for the first time metalworker. Thank you so so much. Love the demonstration of working & shaping metal to create beautiful organic jewelry. Her demo on applying color to metal with a flame was also wonderful and sure to make these very soon! Such beautiful work and thx for the tips. This is one one the very first pieces I made after finding the Beaducation web site. I made this for my husband and it turned out just like the one Kim made and that's all it took to hook me. Unfortunately my hubby didn't like it because it was a bangle although he did think it turned out quite well. I iove Kim St Jeans videos. She is so easy to listen to and makes things so easy to understand. After watching this video I have no hesitation about grabbing my torch and getting started. Her demo and explanation of flame patina is the best I've seen. It's a shame that those beautiful colors won't stay. What can I say?! This class was awesome!! I had often seen metal forming classes in the past and was never really interested. I decided to take a chance and look at this teaching session with Kim St James and I cannot tell you how it has inspired me to have a go at it! Kim is a fabulous instructor and I found all of her information easy to understand and relevant. I especially loved the information regarding the patina choices that are available. It was truly an added bonus. I can't wait to get started and will look into getting my first piece of copper sheet metal and texturing tool then I'm on my way. Many thanks for this wonderful class.